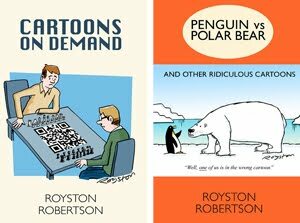 Here are two cartoons submitted to Private Eye – a hit and a miss. The top one is in this week’s issue. Expect to see the show they’re watching on Channel Five within three years. You read it here first. The second gag I’m posting here because it’s one of those topical ones that you can’t send on to another mag because the story is finished. 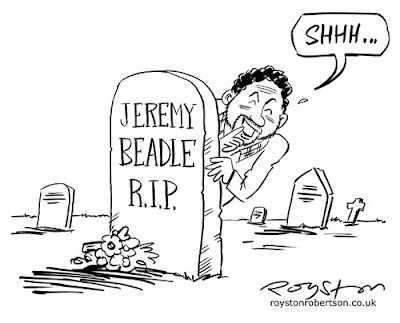 (Note for international readers: Jeremy Beadle was a TV practical joker who died last week). I was pleased with the cartoon as I thought the joke was simple and funny. I thought it was in with a chance as the Eye often goes for “gravestone” gags after the deaths of well known personalities. But what do I know? They passed on it. I also considered just the gravestone with the words “Beadle’s Not About” (after his show “Beadle’s About”) but decided against it. The following day that was the headline on the front page of The Sun, proving that my skills as a newspaper sub-editor (I was one for eight years) are still intact! I'll bet they did (I notice Matt in the Telegraph had angels in heaven playing a practical joke on Beadle) and I expected to see one in the Eye, even if not by me! But there was nothing on Beadle. He's probably too low-brow for them.